Not your credit/debit card number. See photo above. In dollars. Cannot exceed $100. 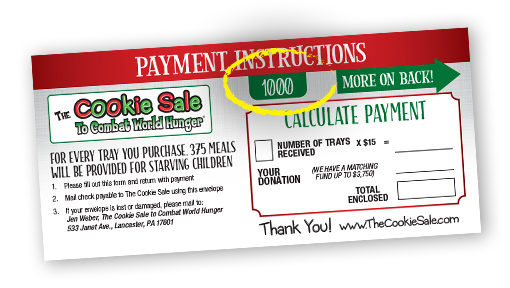 Last year's Cookie Sale raised enough money to help Cross International feed more than 3.6 million people. This was achieved with the help of Cross International finding new ways to stretch The Cookie Sale proceeds. 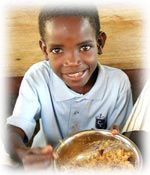 Our goal for this year is to feed over 3.6 million people! 100°/o of the proceeds from the Annual Cookie Sale goes to Cross lnternational's Hunger Relief Program in Haiti! For more information on The Cookie Sale or to find out how you can take part, click here or call 1-866-COOKIE-9 (1-866-266-5439). 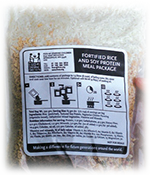 Vitafood contains a scientific blend of vitamins, minerals, protein, fat, fiber, electrolytes and carbohydrates, specifically developed to feed malnourished and starving children. 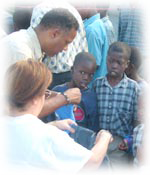 Each bag provides six nutritious meals.